Walking by faith means to trust in God even though it is unclear of the outcome. It is one of the great mysteries of God that He is able to lead and direct us even when we cannot see how it will all work out. One major mistake that many people make is putting faith in an idea that was not of God. We need to be sure that the calling is from God and then realize that God will complete the task. God will not fail. Peter asks Jesus to reveal if it was truly Him and if it was Him to call him to walk on the water with him. Jesus answered both and Peter got out of the boat and walked on water out to Jesus. 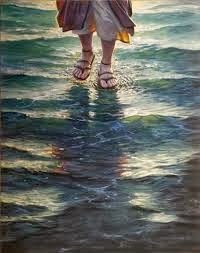 Peter could not see how in the world anyone could walk on water (it is impossible), but the faith he had in Jesus made it possible. There were eleven others in the boat with Peter, what a missed opportunity for them by staying in the boat. Be lead by faith, rather than fear.